We serve those who served before us. “To provide Military Funeral Honors for deserving Veterans, Retirees and Active Duty members on behalf of the President of the United States, the United States Air Force and a grateful nation; in a dignified and professional manner reflecting the dedicated and faithful service rendered by our comrades who have left our side." All off-base ceremonies must be approved through our Public Affairs office. We are responsible for providing funeral honors for every Air Force veteran throughout the entire state of Arkansas as well as Shelby and Tipton counties in Tennessee. If you need a funeral performed outside of our Area of Responsibility, please refer to the spreadsheet here to find out which Base Honor Guard covers the county your funeral will take place in. *Funeral honors can only be rendered once. Please be aware of this when making arrangements. 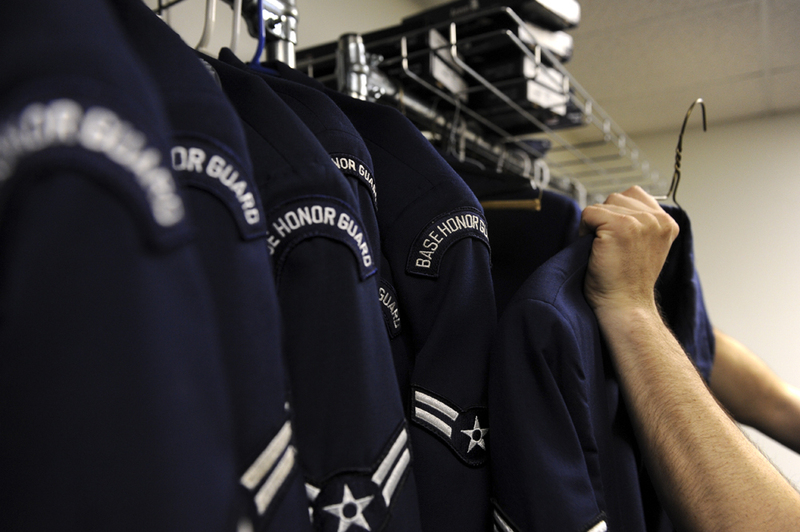 *The honors we render are based on whether the member was a veteran, a retiree or active duty. We operate 24 hours a day, 365 days a year. If you need military honors, please don’t hesitate to notify us. Complete the Funeral Honors Request Form. Fax the completed form and the member’s DD 214 to (501) 987-6310. We’ll call to confirm the details of your request as soon as we receive it. If you do not hear from us within a reasonable amount of time of sending your request in, please call us at 501-987-6317 to confirm we've received it. What to do if the family doesn’t have a DD 214? Please send your request. We can get you on our calendar and work on obtaining proof of service. Call the VA emergency DD 214 request line at (314) 801-0800. They deal strictly with providing DD 214s for the purpose of recieving military honors. Typically, they can provide a DD 214 within 24 hours. Our team performs color guards for functions on Little Rock Air Force Base and the surrounding communities. However, our primary mission is providing military funeral honors. All other functions are secondary and are conducted based on manning availability. Additionally, off-base functions require approval from our Public Affairs office. Complete the Color Guard Request Form. Fax the completed form to 501-987-6310. We’ll call you back to confirm the details as soon as we receive your request. We’ll let you know about the final decision as soon as we find out. We do not provide the flag. If you’d like us to perform a flag fold for your ceremony, please provide a 5’ x 9’6” cotton flag.